The bong is often under appreciated. This is a device used for smoking tobacco, cannabis or a number of other herbal substances, and has been around for hundreds of years. The first water pipe as these devices are also called was developed in China during the late Ming Dynasty meaning people have used bongs since the 16th century. What made the first person decide to create a pipe is unknown, but chances are good he or she was aware of the pain caused by a lungful of strong, thick black smoke. Carbons from cigarettes when smoked have always caused coughing, choking, and red watery eyes. It’s also not healthy for the skin and the lining of the throat. In the last few generations, smokers are warned about the dangerous chemicals they are inhaling with every puff. While fluid can’t draw out all these impurities it’s easy to see by the white puffy clouds that fill a bong most fumes are purified through the use of water. 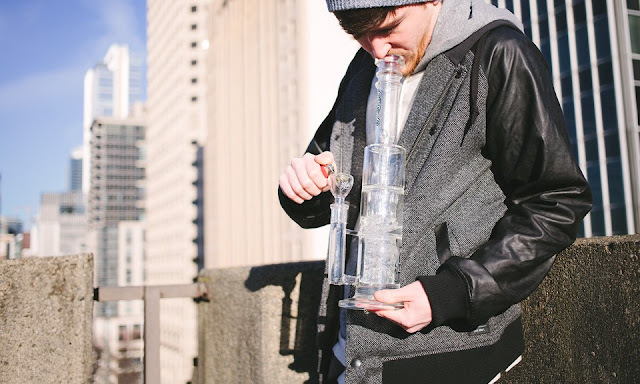 The fluid at the bottom of a bong will trap heavier particles along with water-soluble molecules preventing them from being inhaled. 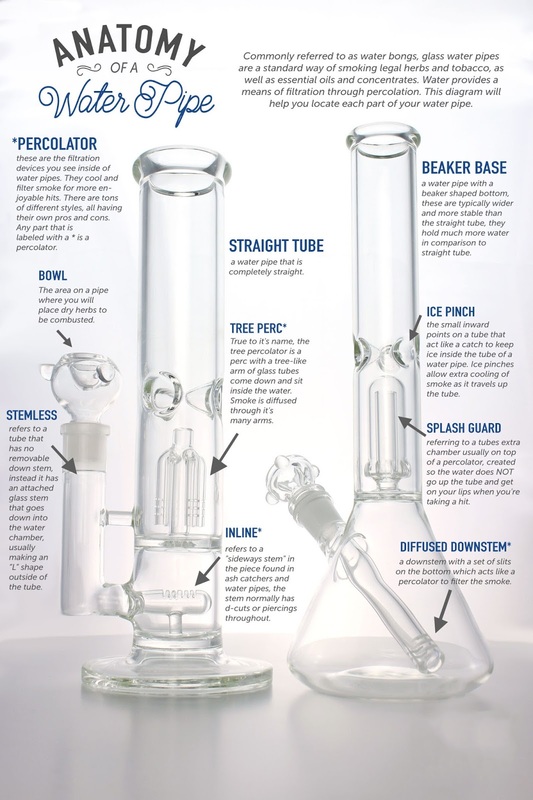 This is the reason that by the late 1960’s the bong became very popular in the U.S. and the U.K. as those who enjoyed recreational marijuana use looked for a healthier way to use the substance. The clearer burning fumes also helped to keep the use of cannabis a private matter rather than signaling the use of a herb to anyone nearby. Starting at the top a bong you are looking at the mouth inhalation hole. This is the spot where you draw inward to make the pipe work. Directly the below the mouthpiece is the chamber. If you never realized this area has a name, don’t feel bad as it is appears as nothing more than simply the top portion of a bong. Below the chamber is where the smoke will move upward into the chamber from the water. At the bottom is the water. Partially submerged in the water and extending out of bong just below the chamber area is the stem. When in use the water should only partially cover the stem that extends both into and pipe’s side. When in use all the parts will work to do exactly what devices like this have done for thousands of years, which is to protect you from harsh smoke. Instead of inhaling a mouthful of carbons and burning paper as you would with a cigarette, the pipe cleans the smoke of many impurities through a uncomplicated filtration system. You can use regular room temperature tap water, but many have found that cold water, or even icy liquid works better, and cools the smoke down making it smoother to inhale. You will pour just enough so the stem is submerged, but be careful not to overfill or it will splash up and possibly get into your mouth. It can also drench the bud if too much water is added. At the side of a water pipe the bowl is the tablespoon sized rounded part of a bong’s stem. In most pipes you can remove this to act as the carb when you later need to clear the smoke. The bowl should be pack to the point just under the rim. It’s best to break up the cannabis you are using first. You can use your fingers for this process, or if you want a pair of scissors. Some users find that grinding marijuana, tobacco or whatever substance they want to use before putting it in the bowl works best. Be careful not to pack too little or it can actually be sucked down the pipe as you smoke. If you pack it too densely, however you can clog it. The next step is to place your mouth onto the inhalation mouthpiece. On some bongs this is a clearly designated spot whereas with others it’s merely the top of your water pipe. The lips of anyone using it should be placed inside the rim not around it. Press the mouth firmly in this position, but not so firmly as to leave marks round the mouth. You will want to place your finger onto the carb if there is one. Some water pipes will have holes somewhere on the side or at or near the stem. If there’s not one then you may need to remove the bowl piece once the chamber is filled with smoke, but if this piece isn’t removable then there’s truly no carb on the pipe at all. The function is necessary to smoke, so you can proceed without clearing the smoke. This is the part that’s awkward for some new to using this type of device. 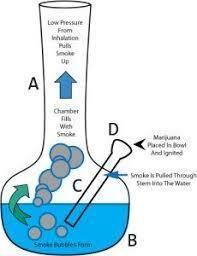 You need to ignite the substance in the bowl while inhaling at the exact same time. This can be done with a lighter or match. Stop inhaling as soon as the substance starts to glow red. Then fill the chamber with smoke by sucking on the pipe.